In a nutshell, this dissertation is about supervised machine learning of Schenkerian analysis. I describe a probabilistic model of Schenkerian music analysis, and illustrate how to use the model to analyze new music. Humans judge the algorithmically-produced analyses to be, on average, about one letter grade (A-B-C-D-F) below corresponding analyses done by a professional. Abstract: Schenkerian music theory supposes that Western tonal compositions can be viewed as hierarchies of musical objects. The process of Schenkerian analysis reveals this hierarchy by identifying connections between notes or chords of a composition that illustrate both the small- and large-scale construction of the music. We present a new probabilistic model of this variety of music analysis, details of how the parameters of the model can be learned from a corpus, an algorithm for deriving the most probable analysis for a given piece of music, and both quantitative and human-based evaluations of the algorithm's performance. In addition, we describe the creation of the corpus, the first publicly available data set to contain both musical excerpts and corresponding computer-readable Schenkerian analyses. Combining this corpus with the probabilistic model gives us the first completely data-driven computational approach to hierarchical music analysis. For anyone planning on printing this (wishful thinking, perhaps), note that Appendix A is very long and may not be worth the trees. Please cite as: Phillip B. Kirlin. A Probabilistic Model of Hierarchical Music Analysis. PhD thesis, University of Massachusetts Amherst, February 2014. These data constitute a superset of the data used in an earlier paper. Each piece of music has a MusicXML file that contains the notes of the excerpt, and an analysis file with the Schenkerian analysis of the excerpt. The analyses mainly list the prolongations present in the music. Each prolongation is in the form X (Y) Z where X and Z are lists of notes that are prolonged by the notes in Y. One of X and Z may be absent. 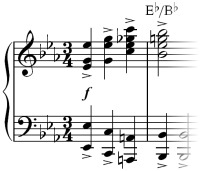 The notes in X, Y, and Z are given so that they may be easily located in the MusicXML file. Each note is specified with a measure number, pitch, octave, and occurrence. For instance, 4f#5-2 specifies the second occurrence of the F# in the fifth octave (using scientific pitch notation) of the fourth measure.